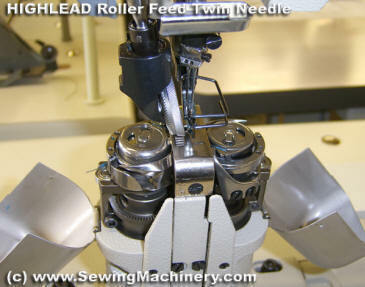 The Highlead GC24618-1 is a twin needle lockstitch post bed machine which features a combined triple feeding system utilizing: needle feed, bottom driven roller feed and top driven roller feed for optimum feeding performance. 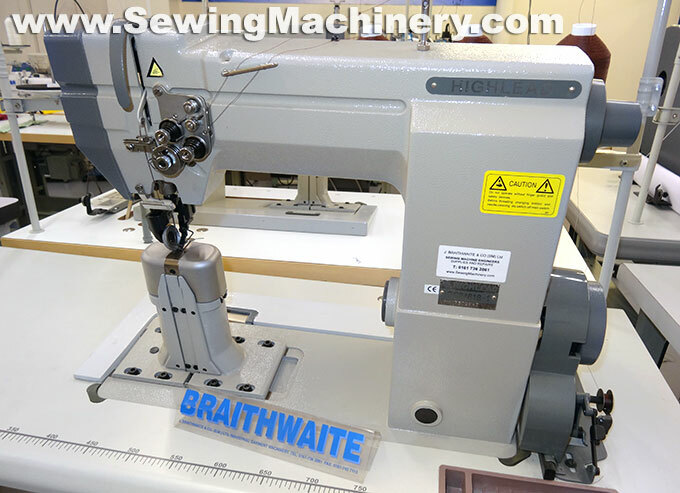 The machine is designed for stitching light to medium heavy items such as: leathers, boot tops, shoes, upholstery and other difficult to feed material including: vinyl, polyethylene plastics, oil cloth, canvas, coated and laminated fabrics etc. The versatile post bed design allows you to stitch hollow, tubular and shaped items which can not normally be done on standard flat bed machines. The driver top & bottom roller feed system makes it easier to do fancy or detailed stitching where many changes in stitch direction are required.